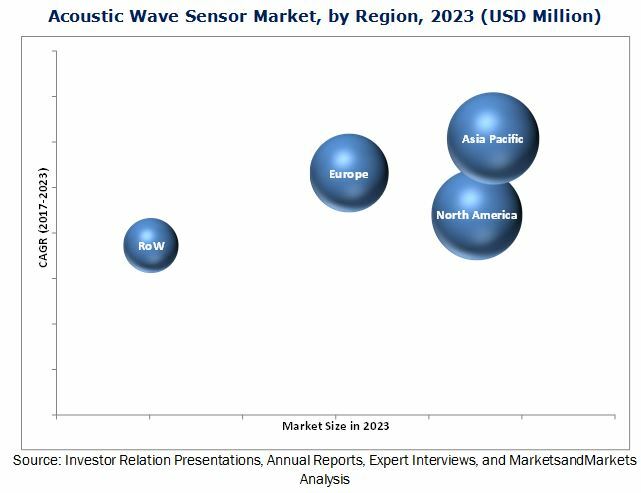 [139 Pages Report] The acoustic wave sensor market was valued at USD 422.8 Million in 2016 and is expected to grow at a CAGR of 10.7% between 2017 and 2023. The growing demand for acoustic-based temperature sensors from the various verticals fuels the growth of the acoustic wave sensor market for the temperature sensors. The increasing need of sensors for security and surveillance applications with the rising reliability on acoustic wave sensors is the key driving factor for the acoustic wave sensor market. The base year considered for the study is 2016, and the forecast period considered is between 2017 and 2023. The objective of the report is to provide a detailed analysis of the acoustic wave sensor market on the basis of type, device, sensing parameter, vertical, and geography. The report provides detailed information regarding the major factors influencing the growth of this market. The research methodology used to estimate and forecast this market begins with capturing data on key vendor revenue through secondary research such as IEEE journals, The Science Direct and Sensor Magazine, and the newsletters from the leading players. The vendor offerings have also been taken into consideration to determine the market segmentation. The bottom-up procedure has been employed to arrive at the overall size of the global acoustic wave sensor market from the revenue of key players. After arriving at the overall market size, the total market has been split into several segments and subsegments, which have then been verified through primary research by conducting extensive interviews with the key officials such as CEOs, VPs, directors, and executives of the companies in the acoustic wave sensor industry. The market breakdown and data triangulation procedures have been employed to complete the overall market engineering process and to arrive at the exact statistics for all segments and subsegments. The breakdown of the profiles of primaries has been depicted in the following figure. The acoustic wave sensor ecosystem comprises manufacturers, system integrators, and distributors. The players involved in the development of acoustic wave sensor include Vectron International Inc. (US), Qualtre, Inc. (US), SENSeOR SAS (France), Sensor Technology Ltd. (US), NanoTemper Technologies GmbH (Germany), Althen GmbH Mess- und Sensortechnik (Germany), Transense Technologies plc (UK), pro-micron GmbH & Co. KG (Germany), H. Heinz Meßwiderstände GmbH (Germany), and Hawk Measurement Systems (Australia). This research report categorizes the global acoustic wave sensor market on the basis of type, device, sensing parameter, vertical, and geography. The acoustic wave sensor market is expected to be worth USD 868.3 Million by 2023, at a CAGR of 10.7% between 2017 and 2023. The growth of this market is propelled by the high demand for SAW-based temperature sensors from various verticals. The industrial vertical held the largest share of the acoustic wave sensor market in 2016 as it involves the largest use of sensors. The automotive vertical held the second-largest market share in 2016. This dominance is attributed to the use of acoustic wave sensors for the security and surveillance applications in these verticals. For instance, pressure sensors are built into tires of cars to wirelessly transmit the pressure data to the driver of the vehicle. This helps prevent accidents caused by tire burst by warning the driver about low tire pressure. The resonators segment held the largest size of the acoustic wave sensor market in 2016. The resonators are not altered by fluctuations in source and circuit voltage. Therefore, they are suitable for the applications such as automotive keyless entry and tire pressure monitoring. The temperature sensing parameter holds the largest share of the acoustic wave sensor market. The resonators are not altered by fluctuations in source and circuit voltage. The acoustic wave sensors for temperature sensing are used for critical applications such as monitoring rotating machine components and combustion chambers in the industrial and automotive verticals. North America dominated the overall acoustic wave sensor market in 2016. Technological advancements, low manufacturing costs, and wireless and passive nature of the products are the major factors propelling the demand for the acoustic wave sensors in this region. The automotive vertical is a major contributor to the growth of the acoustic wave sensor market in North America in terms of market size. The use of acoustic wave sensors in the military segment is a major factor boosting the growth of the market in the region. The US military runs laboratories to provide superior technologies to its militants. The market in APAC is expected to grow at the highest CAGR to surpass the market in North America by 2023. The technical issues associated with energy consumption and sensitivity is one of the major challenges witnessed by the acoustic wave sensor market. Devices based on metal-oxide-semiconductor technology consume more power than the electrochemical devices. Gas sensors face difficulty with the maintenance of a high level of sensitivity to detect different gases under high humidity conditions. Various sensors have different sensitivities, and their functionalities are specific for particular atmospheric conditions. Market players such as Althen GmbH Mess- und Sensortechnik (Germany), Vectron International Inc. (US), Qualtre Inc. (US), SENSeOR SAS (France), NanoTemper Technologies GmbH (Germany), and Transense Technologies plc (UK) are focusing on product launches and developments, mergers, acquisitions, and collaborations to enhance their product offerings and expand their business. *Details on Business Overview, Product Offering Scorecard, Business Strategy Scorecard, Recent Developments, and Key Relationships Might Not Be Captured in Case of Unlisted Companies.